As a boy, I remember eagerly poring over the employee magazine from Cominco, the metals smelter where my father worked. It was printed on thick glossy paper in full color — an expensive proposition in the early 1980s. In some ways, those were the glory days for internal communications departments. They operated as miniature news rooms, with staff writers, photographers, deadlines and a sizeable print budget. Over the next two decades, though, most paper-based internal communications were gradually replaced with electronic ones. Some communications went to email, others to intranets, but neither received the same love and attention enjoyed by their physical forebears. According to The Radicati Group, the average business user receives 88 emails per day. But for some, it’s much worse. The point for internal communications teams? You can’t trust that an important message will be noticed if you send it by email. Employees are drowning in it. In an effort to reduce email, many internal communications teams have attempted to shift news and communications to an intranet. Now, I have nothing against intranets — I’ve worked on them for two decades, and I even co-founded ThoughtFarmer, a leading intranet software company. However, most intranets are not critical to employees’ day-to-day jobs. Because they’re not critical, many employees go days or weeks without visiting them — completely missing the news and communications. So are enterprise social networks the answer? Hardly. Keeping up with the endless stream of updates from Yammer or Slack barely works for teams of 10 or 20. As a broadcast medium for thousands of employees, social networks have nothing good to offer. If I was a director of internal communications, I’d be frustrated. I have to ensure employees never miss an important communication, yet I’m competing with a deluge of messages across all mediums absolutely bombarding those same employees. For the innovative communications professional, I see a solution in chatbots. I believe chatbots will save internal communications. And I’ll give you 10 reasons why. But first, what are chatbots? A chatbot is software that communicates with you via messaging apps such as Facebook Messenger, Skype, or SMS. You already use messaging apps today to communicate with family and friends. You can do the same with chatbots, but instead of messaging with a real person, you’re messaging with a piece of software. For a complete introduction to chatbots, read Matt Schlicht’s excellent article, “The Complete Beginner’s Guide to Chatbots”. 1. All of your employees already use messaging apps. The top 4 messaging apps have more than 3 billion active monthly users. Think about that: 3 billion. That’s more than Facebook, YouTube, Twitter and LinkedIn combined. It’s even more than the number of global email users. And your own habits likely reflect this: you probably use messaging to chat with your son, your mother, and your spouse. Messaging apps are pervasive. 2. Chatbots reach employees who don’t have email or computers. For years, it’s been a struggle to get digital communications to employees in 5 industries: healthcare, hospitality, industrial, logistics, and retail. The majority of workers in these industries do not sit at computers or rely on email. But a sea change has occurred in just the last couple of years: now almost all of them have smartphones in their pockets. If you need to get a message to the disconnected worker, chatbots are the first medium since letter mail that you can count on. 3. Chatbots are both push and pull. Email is a push medium: you “push” messages to employees, who have no control over when they will receive them. 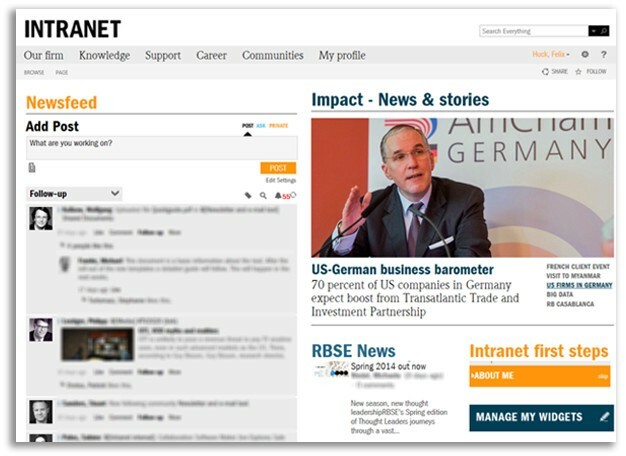 Intranets are a pull medium: employees “pull” messages by requesting them in a web browser. Chatbots are both push and pull. You can broadcast messages to employees on a schedule that you define. Or employees can request messages on demand by entering simple commands like “news please” or “show tomorrow’s schedule”. This flexibility addresses internal communications’ need to get a message out on their schedule, and employees’ need to access information on theirs. In this example, a user asks “What is today’s schedule?”, and the chatbot responds. 4. Chatbot messages are easier to read. Chatbot messages are easy to read because they’re short and to the point. The medium simply doesn’t support long-winded essays. 5. Chatbot messages are easier to write. Short messages are not only easier to read, they’re easier to write. Every time a communications professional sets out to write a 500- or 1000-word article, it’s a challenge. But a chatbot message is often just a single sentence, and a chatbot article is often just a few short paragraphs. CNN’s chatbot, for example, condenses long articles into 3 or 4 sentences. Writing 50 words is a lot easier than writing 500. 6. You don’t have to log in to a chatbot. To access the intranet of a recent client, I had to install VPN software, request a VPN logon, get a network ID, register my cell phone, enter a one-time authorization code, launch a browser, and enter a web address. Can you imagine an employee going through those steps simply to check if there are any new messages from internal communications? Unlike an intranet, you don’t have to log in to use a chatbot. The underlying messaging app knows who you are and shares that information with the bot. You don’t have to launch an app, either — messaging apps are always running in the background, ready to receive messages. 7. Chatbots are fully accessible by users with disabilities. Supporting users with disabilities can be a challenge for intranets (or magazines, for that matter). Some intranet software doesn’t even attempt to adhere to the Web Content Accessibility Guidelines (WCAG). But adherence is both a requirement for many large organizations and the right thing to do. Chatbots don’t have an issue here. One of my wife’s good friends is blind, and the two of them message each other all the time. The underlying messaging apps and operating systems used by chatbots are fully accessible and work very well for users with disabilities. Chatbots work for users with visual impairments. In this screenshot, large, high-contrast fonts are enabled in Facebook Messenger. 8. Most chatbot messages are read within minutes. Do you check your phone when it chimes, alerting you to a new message? Most people do. According to one study, 90% of text messages are read within 3 minutes of delivery. That’s the kind of instant and complete penetration that email, intranets and magazines can only dream of. 9. Chatbots work perfectly in low bandwidth. Because they’re short and text-based, messages from chatbots don’t need high-speed internet. For your employees in remote locations, chatbots are an ideal way to send communications. 10. Chatbots work perfectly without internet. Not only do chatbots work with poor internet, they work with no internet. 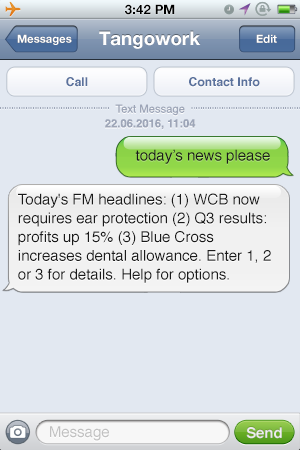 Chatbots work just fine over SMS, the basic text messaging that’s been standard on every mobile phone network for over a decade. For many years now, internal communications teams have faced a seemingly impossible task: ensure that no employee ever misses a critical communication, while competing with a firehose of information on dozens of channels. Chatbots can’t eliminate that firehose. But they have advantages as a communications channel that no other medium can compete with. Perhaps in a few years, we’ll all be deluged with chatbot messages and be seeking ways to manage them. But right now, for those internal communications professionals that are the early adopters, chatbots will be the most trusted way to deliver a message.